Expanding upon the annual literacy/dictionary program that Amador Upcountry Rotary has maintained for over 20 years, Club President Mike Spence recently delivered a unique nature-science program. 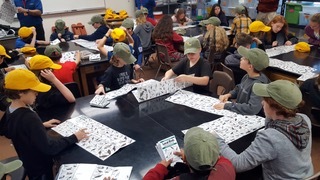 Joined by a few Club members, birding enthusiast Mike Spence presented over 50 students at Pine Grove Elementary’s Stem Den with cedar Bluebird boxes, folded bird and animal track identification guides, as well as colorfully embroidered bird hats. The day included a fun and educational overview of our local bird species, including discussion about their migration patterns and agricultural benefits. 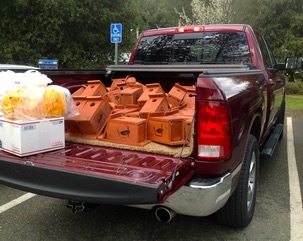 Not only will Western and Mountain Bluebirds be thriving in nesting boxes at quite a few upcountry homes, but identification and appreciation skills will be improving well into the future. Everyone is welcome to attend Upcountry Rotary meetings for dinner at 5:30 p.m. on the first three Thursdays of every month at the St. George Hotel in Volcano.